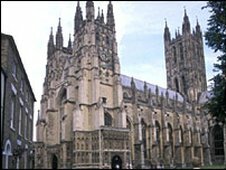 A service has taken place at Canterbury Cathedral to remember people who have died in road crashes. The event, to mark the World Day of Remembrance for Road Traffic Victims which is observed across the world, was the first of its kind in the cathedral. Paper oak leaves made by schoolchildren in Kent were laid on the cathedral floor so friends and relatives could write victims' names on them. The World Day of Remembrance was first held in the UK in 1993. It was set up to draw the attention of the public to the costs and consequences of road crashes, and measures that could prevent them. The Very Reverend Dr Robert Willis, Dean of Canterbury, said: "We are very pleased to hold a service on the day of remembrance for road traffic victims here in Canterbury Cathedral for the first time." Adding that services for the World Day of Remembrance were gaining in importance across England, he said it would be an occasion of great significance and a time of mutual support and comfort. John Davies, chairman of Kent County Council which helped to organise the event, said: "I cannot think of a more fitting way to remember those people who have lost their lives in road traffic accidents." He said the cathedral was a a wonderful backdrop for this remembrance service and he was sure the occasion would bring some comfort to relatives who have lost loved ones in such tragic circumstances. He said figures for road crashes had fallen in recent years, but everything possible must be done to ensure the decline continued.